As part of the city’s 375th anniversary, Urban Sketchers Montréal, in collaboration with Heritage Montréal, is organizing Monument Montreal, an exhibition that will take place at the Hall of Honour of the City of Montreal from August 23 to September 6, 2017. Over 50 sketches and about 12 sketchbooks will be on display. The objective of the show is to display the panorama of Montreal in all its diversity: public monuments, historic buildings, vernacular architecture, as well as parks and natural spaces. According to Urban Sketchers tradition, all creative work must be done on location, and the use of reference photographs is not permitted. We are hoping to have a big pile of sketches and sketchbooks to choose from, so if you are a sketcher from Montreal, or a visiting sketcher who has sketched the city, please consider entering your work in the show. All levels are welcome and encouraged, as long as they follow the guidelines outlined on the site. 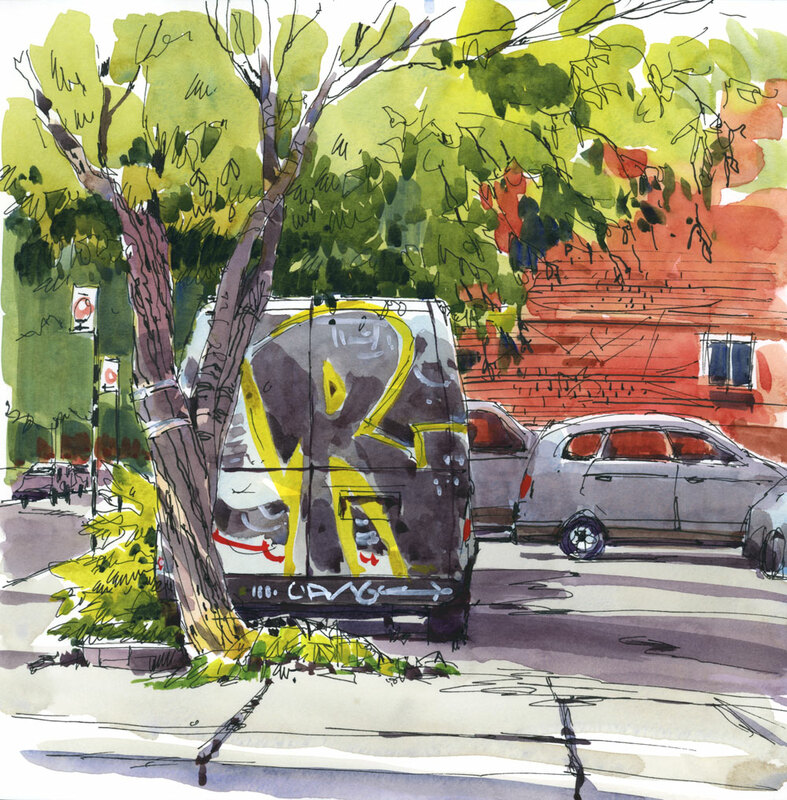 With that show in mind, I did a little sketching on St. Viateur in Montreal’s Mile End district. I don’t do much vehicle drawing but this old van parked at a garage on the corner of St. Urbain caught my eye. It’s an interesting process to attempt to render the graffiti, both with positive and negative painting and a little Titanium White. What a wise choice! I too love the composition. The contrast of colours, and the contrast of geometric shapes with the graffiti especially, and the bit of foliage. So eye catching. A winner! ( as always). Love your work!